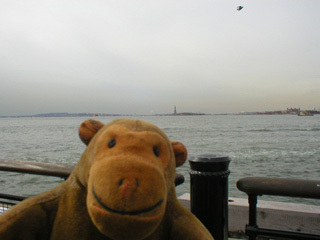 "There's a bit of a nip in the air today"
Mr Monkey waited in line on the quay for quite some time. After a bit, he hid in Mr Rik's pocket while they went through some security checks. Then after some more waiting, the Miss New Jersey arrived. Mr Monkey scampered aboard, and ran up all the stairs he could find to the sun deck. 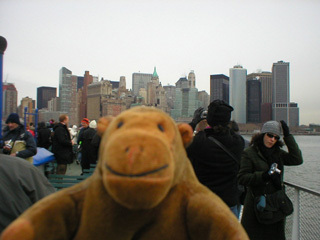 There wasn't much sun as Mr Monkey looked back at Manhattan, though.